Town Centre Securities are proud to be attending MIPIM 2019 as part of the Leeds City Region and Manchester delegations. We will be profiling the opportunities which exist within our portfolio to the attendees of the world’s leading property conference on projects including our key developments across both cities. 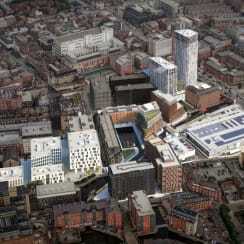 •	Masterplan totals 324,000 sq. 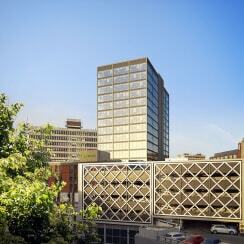 ft. of offices in 3 buildings along with a 500 space multi-storey car park. 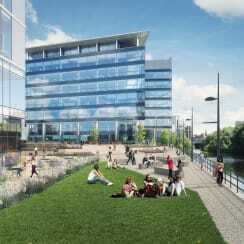 •	The site’s central location and river frontage gives particular appeal. •	This area of Leeds has seen substantial development in recent times including the development of the Government Property Unit office directly opposite this site. 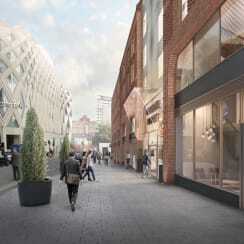 •	TCS were chosen as Leeds City Council’s development partner to carry out a major scheme to revitalise this historic site in Leeds city centre. •	Proposals include replacing the current outdated 1930s and 1980s buildings with a new 136 bedroom apart-hotel with 9 commercial units at ground floor. 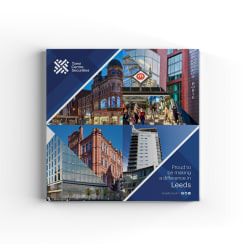 •	The high standard of the proposed development will attract high quality retailers which will not only add value to but also complement the existing offer at Leeds Kirkgate Market. •	The major redevelopment of the original 1970’S office block into an innovative public sector building was completed by Town Centre Securities in 2018. •	Comprising of over 170,000 sq. ft of state of the art offices. •	Home to over 2000 Leeds City Council staff and all their public facing departments including the city’s One Stop facility..
•	Planning submitted for a new 17-storey office building as part of Town Centre Securities Merrion Centre mixed used scheme. 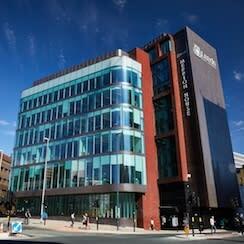 •	The new building would offer 10,000 sq. ft of ground floor retail space. •	In addition, the plans include circa 169,000 sq. ft of commercial office space. 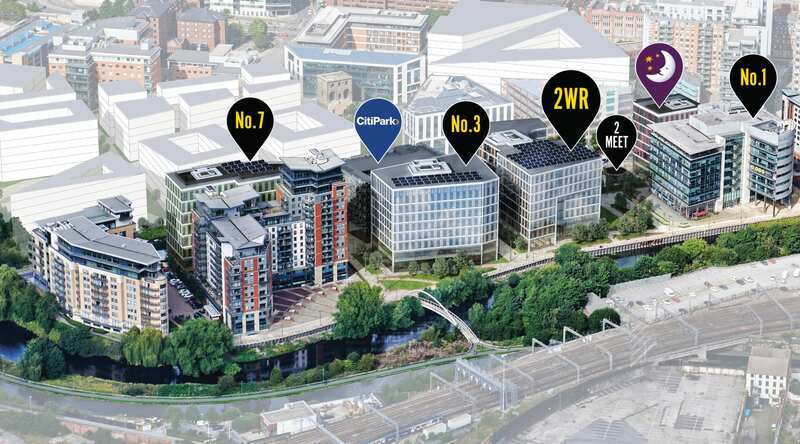 •	Acquired by TCS in late 2018, the Cube is situated on the edge of the Leeds’ ‘Innovation District’ close to the city’s retail and office core. 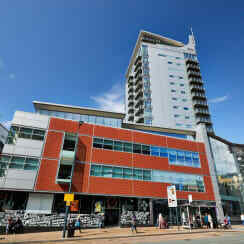 •	Piccadilly Basin is a 12.5 acre site and includes a whole host of buildings, car parking and future development sites. 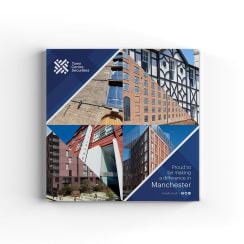 •	A strategic regeneration framework is in place with Manchester City Council which identifies 800 residential units, a 500 space multi-storey car park and 200,000 sq/ ft of canal side commercial development. •	The agreement allows us to plan a residential development which will enable us to establish a significant residential portfolio in this prime area of Manchester. 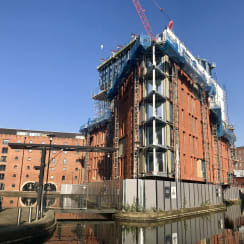 •	Due to complete in May 2019, Burlington House offers waterside living in the heart of Manchester’s Piccadilly Basin. •	With 91 units spread over 11 floors, Burlington House will offer contemporary living in a choice of 1, 2 and 3 bedroom apartments. •	The scheme offers a unique design with TCS working with internationally acclaimed architects Simpson Haugh. 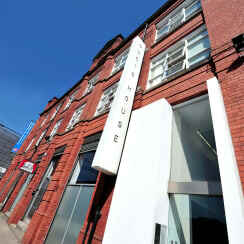 •	Ducie House is an established city centre address for its creative industries, and is home to an eclectic mix of exciting and innovative tenants – including fashion designers, record labels and design agencies. •	It offers 64 unique office and studio spaces totalling over 33,000 sq ft.
•	All units retain the character of the former petticoat factory and offer accommodation ranging from 82 to 3,900 sq ft.